Kaipara is known as the Kumara region in New Zealand, with Dargaville as its capital. 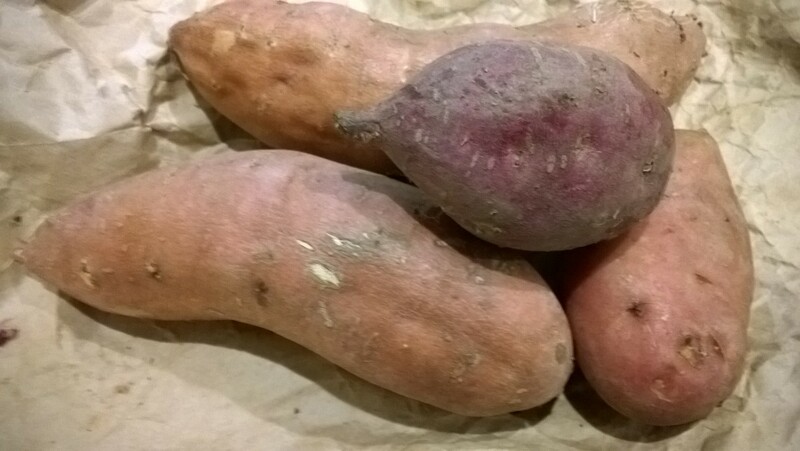 We are lucky enough to go to the Kaipara a lot and so we’re never short of great local Kumara’s.The Kumara, or sweet potato got to New Zealnd with the first Polynesian explorers. It’s not certain how they got hold of it, but there is strong evidence they had sailed to South America, where the Kumara is native, before they got here. Thats a pretty amazing story. I got introduced to Kumara in the early 90’s when i first backpacked around NZ. I got them served as part of a roast lamb dinner, and was blown away by that melting sweet taste. I did not understand that I had not had them before, that nobody had had the wits to introduce them in our potato eating country. I should have acted on that idea, as they are available everywhere now! But I never forgot thattaste and was so happy seeing them again when I moved here. I still love cooking with them and roasting is still a favorite with some good olive oil and fresh rosemary. Then eaten like that or cool them down and put in a salad with some feta and walnuts.Or make an amazing mash with some coconut milk. This entry was posted in A to Z challenge, kaipara, localfood, nz general and tagged a to z, cooking. Bookmark the permalink.